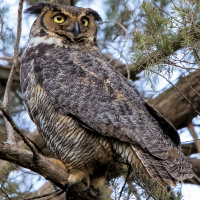 Introduction: The Great Horned Owl is a very large, powerful owl with prominent ear-tufts. 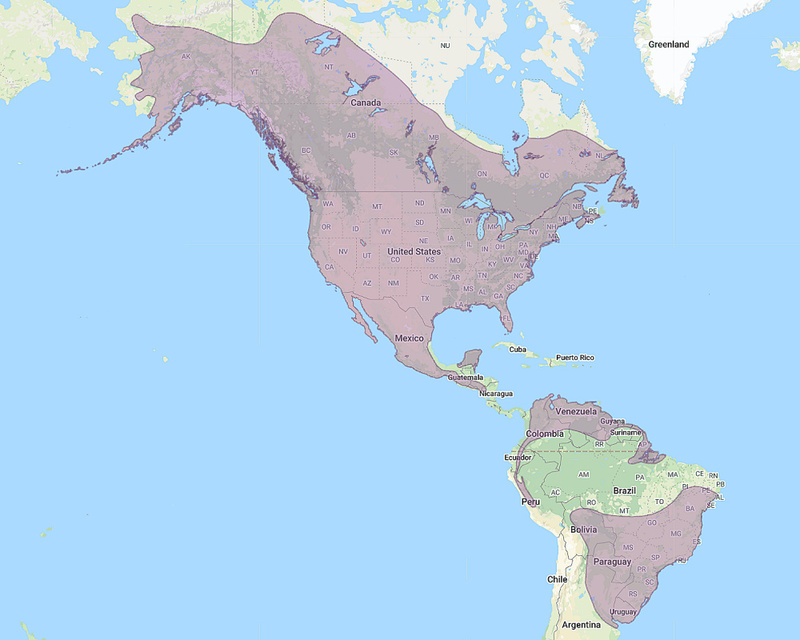 It was first seen in the Virginia colonies, so its species name virginianus was created from the Latinised form of this name. Pair calling - Peck's Lake, New York, USA. March. © Doug Von Gausig. Typical male - Houston, Minnesota, USA. © Karla Bloem. Typical female - Houston, Minnesota, USA. © Karla Bloem. 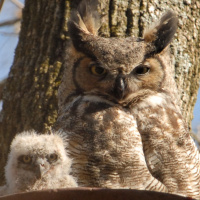 Hoo-hoo-hoo - Houston, Minnesota, USA. © Karla Bloem. Description: The facial disc is rusty-brown to ochre-buff, paler around the eyes, with a prominent blackish rim on each side. Eyes are yellow, with blackish edged eyelids. The bill and cere are greyish. Eyebrows are prominent and whitish. Ear-tufts are long and tousled. 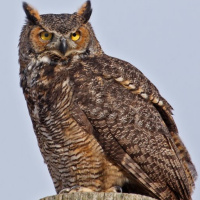 The upperparts are warm brownish-buff, mottled and vermiculated with greyish-brown, black and whitish. The crown is similar in colouration to the mantle, but finely barred dark and light. The outer webs of the scapulars have large whitish areas, irregularly marked with a few dark transverse bars. There is a row of whitish spots across the shoulder which is not very obvious. Flight and tail feathers are distinctly barred dark and light. The outer webs of the primaries are brownish-buff, while the inner webs are much paler. 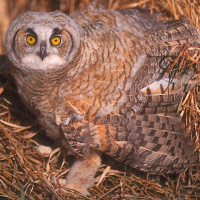 The underparts are brownish-buff, becoming paler towards the belly. 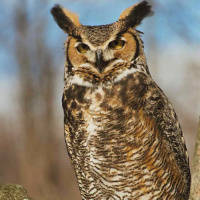 The throat is whitish and very prominent when inflated during calling. 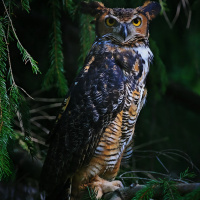 The upper breast has blackish blotches and some cross-bars, and the rest of the underparts are coarsely barred light and dark. Tarsi and toes are densely feathered, with just a small zone at the end of the toes bare, and coloured greyish-brown. 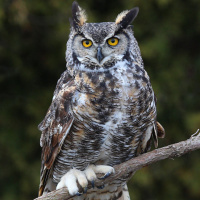 Claws are dark horn with blackish tips. Size: Length 45-63.5cm. Wingspan 91-152cm. Tail length 175-250mm. Weight 900-2503g. Females are 10-20% larger than males. 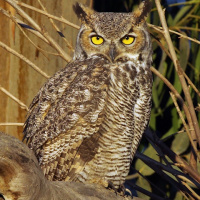 Voice: Great Horned Owls have a large repertoire of sounds, ranging from deep booming hoots to shrill shrieks. 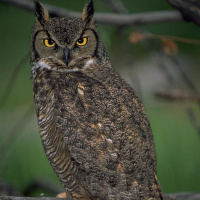 The male's resonant territorial call "hoo-hoo hoooooo hoo-hoo" can be heard over several kilometres during a still night. 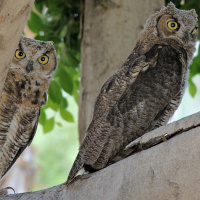 Both sexes hoot, but males have a lower-pitched voice than females. They give a growling "krrooo-oo" or screaming note when attacking intruders. Other sounds include a "whaaa whaaaaaa-a-a-aarrk" from disturbed birds, a catlike "MEEE-OWww", barks, hair-raising shrieks, coos, and beak snapping. Some calls are ventriloquial. Most calling occurs from dusk to about midnight and then again just before dawn. Pellets are very large, about 7.6-10.2cm long and 3.8cm thick. Pellets are dark greyish-black and compact. Skulls as wide as 3cm are regurgitated whole. Pellets are regurgitated 6 to 10 hours after eating. 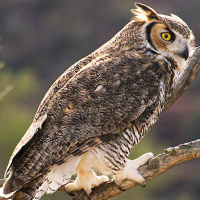 Breeding: Nesting season is in January or February when the males and females hoot to each other. When close they bow to each other, with drooped wings. Mutual bill rubbing and preening also occurs. They do not build a nest of their own but utilise the nests of other birds such as the hawk, crow and heron. They may also use squirrel nests, hollows in trees, rocky caves, clumps of witches broom, abandoned buildings, or artificial platforms. 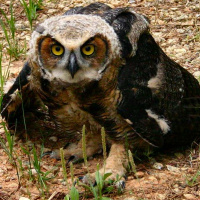 They are extremely aggressive when defending the nest and will continue to attack until the intruder is killed or driven off. 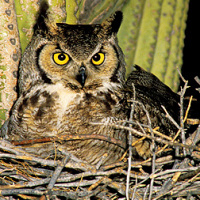 Normally, two to four eggs are laid and incubated by the female only for 26-35 days. 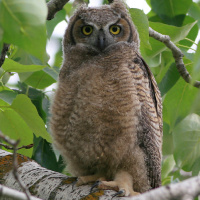 Young start roaming from the nest onto nearby branches at 6 to 7 weeks, but cannot fly well until 9 to 10 weeks old. They are fed for another few weeks as they are slowly weaned. Families remain loosely associated during summer before young disperse in the autumn. 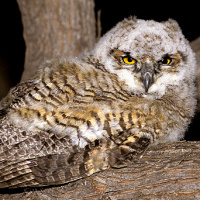 Adults tend to remain near their breeding areas year-round while juveniles disperse widely, over 250 km in the autumn. 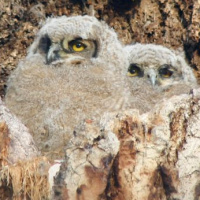 Territories are maintained by the same pair for as many as 8 consecutive years, however, these Owls are solitary in nature, only staying with their mate during the nesting season. Average home ranges in various studies have been shown to be approximately 2.5 square kms. Status: Widespread and locally frequent. Original Description: Gmelin, Johann Freidrich. 1788. Systema Naturae, 1, pt. 1, p. 287. 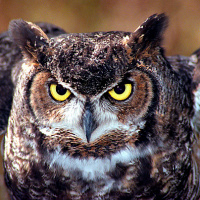 See also: Other owls from North America, Central America, South America, Genus: Bubo. Page by Deane Lewis. Last updated 2016-02-07.